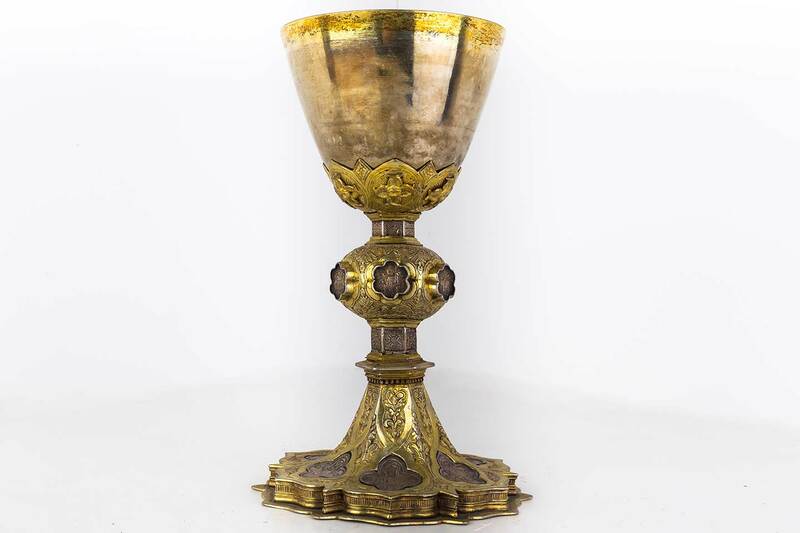 The examples of chalices of the 1400s from Rome and Lazio all have a model: that by Siena goldsmith Guccio di Rannaia created for Niccolò IV and the Basilica of San Francesco in Assisi. The chalice of Canepina falls into this typology with its conical shape and flared base. It follows the liturgical laws for the cup had to be gilded silver since it held the blood of Christ. Although it dates from the 1500s, 1300s-style nails in the central part hold the enamel plaques. There are also winged cherub heads, (one is upside down) embossed according to the style of the 15th century, which could be a later restoration. The hexagonal shaped base is covered with a thick engraved floral decoration framing small panels with figures of saints and the commissioner’s coat of arms on a shield. On the base are six medallions with figures of Santa Felicita, Christ crucified, San Giovanni, Santa Barbara, the Virgin and another saint with the martyr’s palm and a book. These were once enameled. Floral motifs and six hexagonal medallions containing the figures of Pietà, a bishop saint, San Sebastiano, San Paolo, San’Antonio and San Pietro decorate the knot. In the history of sacred art this chalice represents an example for all goldsmiths up to the beginning of the 1500s. The Canepina chalice has several novelties such as the structure and the use of translucid enamels that had been imported to Siena from French miniatures. The archaic octagonal multi-lobed type typical in northern Italy was abandoned. The spread of this new model was thanks to the precocious activity of Siena’s goldsmiths outside the country and in faraway lands. In Lazio most examples are found in the Viterbo area, close to cultural influence of Siena. Unfortunately the commissioner’s coat of arms has not been identified but it is thought that he was connected to an important family of Canepina or a confraternity of the Annunziata church. Ciprini thinks this happened around the 8th century when priests from Canepina were assigned to the church. Due to the absence of sure documentation we cannot be certain of Ciprini’s supposition. The first sure document connected to the Collegiata is the will of Tuccio Transanelli of Canepina dated 1348 who left a sum of money for the restoration of the church where he wished to be buried. Among the interesting documents is one describing a visit in 1571 “visitavit ecclesiam Sanctae Mariae matricem et parrochialem”. Another interesting document of June 3, 1859 mentions that Canepina was transferred from the diocese of Orte and Civita Castellana to that of Viterbo. On December 3, 1872 Bishop Serafini made a pastoral visit to the Viterbo Diocese and obtained part of the relics of the Santa Corona for his church.